The KMA Community Connector Leadership Program (CCLP) is an opportunity for physicians to enhance their leadership skills through education and direct community involvement. Community Connectors are physicians who are engaged in their communities in an effort to promote KMA policies and the practice of medicine in Kentucky by working with business, government and civic leaders. Participants in the program will be highlighted in media releases and KMA publications as a physician Community Connector, receive Continuing Medical Education credit and have the opportunity for training and experience as a physician leader. Become an active member of the Kentucky Medical Association. To renew your membership, click here. Complete a 15-minute informational webinar. Serve in a leadership role within medicine. This can include a leadership position in an organized medical society, organized medical staff, group practice or public health department. Serve in a leadership role in the community at large. This can include a leadership position in a civic, religious or political group. Participate in a public education activity designed to improve public health or educate the public on health issues. Attend and complete the KMA Leadership Academy, which will equip you with the tools you need to become an effective leader within your profession and community. In addition to being recognized as a Community Connector, participants will also have the opportunity to direct a $100 donation to the local charity or organization of their choice. Contact Emily Schott at schott@kyma.org or 502-814-1388 about your intent to participate. KMA staff will contact participants about important dates and program information. "What I love about the program is it highlights the importance of physicians as community connectors. The CCLP allows those positive stories on the medical profession to come forward and to be celebrated." 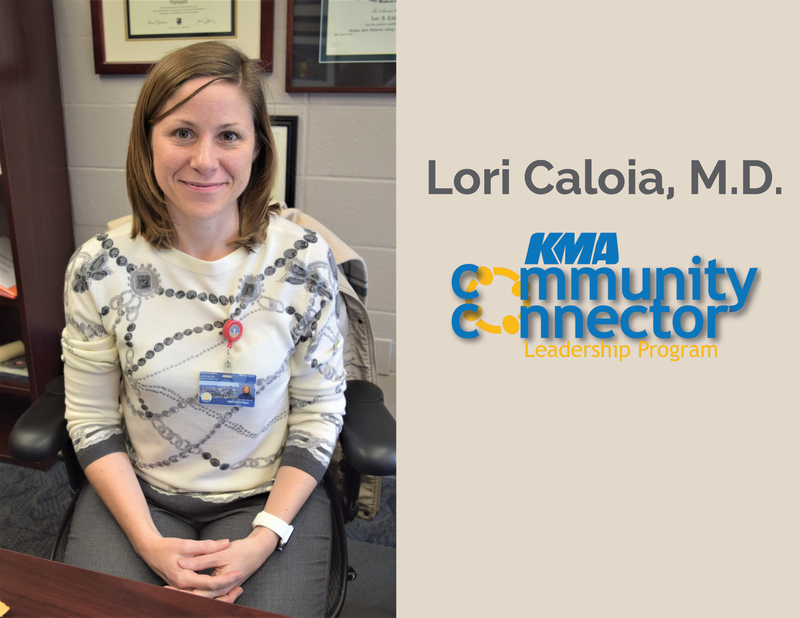 2018 Community Connector Leadership Program (CCLP) graduate Lori Caloia, M.D. works as a tireless advocate for public health as Medical Director of the Louisville Metro Department of Public Health and Wellness. She is also a retired Flight Surgeon in the U.S. Air Force. She recently sat down with KMA to discuss her work in public health and why the CCLP program was such a worthwhile experience for her. What did you learn from your experience participating in KMA’s Community Connector and Leadership Program (CCLP)? The CCLP reminded me of the various facets of medicine. Day-to-day, I feel I am in the trenches working hard at our public health mission in Louisville. Coming out of those trenches, meeting with students and networking with colleagues helped me to reconnect with the traditional medical community. Being in the community and talking with people whose lives have been impacted with the work we do every day helps to keep you motivated. Talk about the public health education aspect of your CCLP experience. As a public health practitioner, obviously I see the value of public health in medicine! Unfortunately, I think that public health and community medicine principles are still under-taught in medical schools today. One reason I gravitated toward family medicine is because of a focus on treating the whole person. The understanding that individuals are connected to their families and their communities, and that society influences health in many ways is something that seemed essential to understand in order to take care of my patients. Individuals don’t make health decisions in a vacuum--a lot goes into individual behaviors. Sometimes behaviors are not choices. One of my biggest frustrations in primary care was that I could not fix the problems that led to poor health for my patients. Providing transportation or a job that provides a living wage, helping children get access to programs that will increase their chances of school success, improved nutrition, and better education are not easily accomplished in a 15 minute office visit. Public health aims to address these things in a community-based way. The KMA’s Community Connector and Leadership Program emphasizes the importance of these complex relationships. Our patients trust us, and our communities look to us for guidance and advice. The program also helps an individual practitioner to see that they really can have a voice in their community, as well as with their legislature. Providing evidence-based public health recommendations can go a long way—usually much farther than our influence on the individual during an office visit. When you first came on board as Medical Director of the Louisville Metro Department of Public Health and Wellness, there was a Hepatitis A outbreak. How did your previous leadership training/experiences prepare you for this? As a flight surgeon in the Air Force, one of my primary roles on base was as a public health leader. I would consider it to be a much smaller version of my current role. Flight surgeons provide advice and medical response to outbreaks on Air Force bases. One experience I recall was a pertussis case in an individual worker on base. This case required a coordinated, rapid and complete response to vaccinate and treat exposed individuals with prophylactic medications. A small portion of the roughly 20,000 individuals on our base were affected. Both the scale and complexity pale in comparison to the current hepatitis A outbreak in Jefferson County and Kentucky as a whole. In the military, though resources were constrained, virtually all affected by the outbreak had some sort of medical insurance, and medications and vaccine were readily available. The affected population was also very easy to identify and treat, with high rates of compliance to treatment recommendations. This is nearly the opposite of what was experienced by our communicable diseases team during the hepatitis A outbreak. Challenges with resource acquisition, effectively reaching infected patients for interviews to identify those in need of prophylaxis, and reaching the known at-risk populations were something I had not previously encountered. Taking on this challenge on my second day on the job was something I will never forget! What other leadership challenges have you faced and what did you learn from these experiences? I have learned the most about leadership from being a follower and through observation. I have witnessed inspirational leaders and those that have become out of touch with the people of their organization and start to lose credibility. One thing I have learned is that to be respected as a leader, you have to work hard—no one wants to follow someone who isn’t willing to put in as much or more effort than you. You also have to take care of your team. Getting to know those who work with you goes a long way. Understanding the challenges that your team faces day to day can help you make better decisions. I have learned that listening to my team usually gives me the answers I seek as a leader. It allows me to push them harder to get better outcomes. I am a quiet and more introverted person by nature, so this style of leadership is more suited to my personality. I don’t see myself as the charismatic leader that pushes people with my words—more so, my influence tends to be in my ability to listen and really hear what is going on around me, and to take this into consideration when making important decisions. As a leader, my choices rarely reflect my own opinion. I have learned over the years, that my brain often hones onto a single solution to a problem at hand, and doesn’t tend to see other options. As a leader, I find great value in humility and patience, and realize that the input of others almost always results in a better solution than my own! What do you feel was the most valuable part of the CCLP or your most important takeaway? Seeing the great work of my colleagues is inspirational and keeps me pushing forward when the going gets tough! There are many talented, creative and caring individuals among us. We are not alone in our struggles or our successes. Knowing that there is support and encouragement out there is reassuring. Having other people that I can bounce ideas off is very helpful in my role. I am lucky to be surrounded by individuals who are subject matter experts in public health and are very passionate about the work they are doing. Often, as an individual, we become short-sighted or single-minded, and getting the honest opinion of thoughtful and informed colleagues is really important to me. KMA’s Community Connector Leadership Program is accepting applications for its 2019 class. Visit kyma.org/cclp or email Emily Schott, schott@kyma.org, for more information. Brent Wright, M.D., MMM, grew up on a family farm in Larue County. “I’ve always had a sense of community and belonging and contributing in a community,” he said. A graduate of the University of Louisville School of Medicine, he’s the first physician in his family. He serves in Glasgow as Associate Dean for Rural Health Innovation, University of Louisville School of Medicine, as Vice Chair for Rural Health and Associate Professor, UofL Department of Family & Geriatric Medicine, and as Medical Director, T.J. Sampson Community Hospital Family Medicine Center. However, medicine wasn’t his first choice. As a McDonald’s All-American percussionist at Larue County High School, he went to the University of Kentucky on a music scholarship. He initially thought music was going to be his “vocation for life,” he said. Once he started college, he felt like music was more of an avocation than a vocation. “You had to track in a certain major and it didn’t seem like a good lifelong fit,” he said. He’s always wanted to be involved and to contribute to his community. As a family medicine physician in Glasgow for the last 20 years, he’s done just that. And not just through his patients. Dr. Wright is actively involved in many organizations, including the Kentucky Medical Association and the Foundation for a Healthy Kentucky. This May, Dr. Wright was re-elected chair of the Foundation for a Healthy Kentucky, where he’s served on their board since 2014. He was also re-elected chair of the finance and audit committee. Dr. Wright has also been very active in the Kentucky Academy of Family Physicians, serving as their president in 2008-2009. 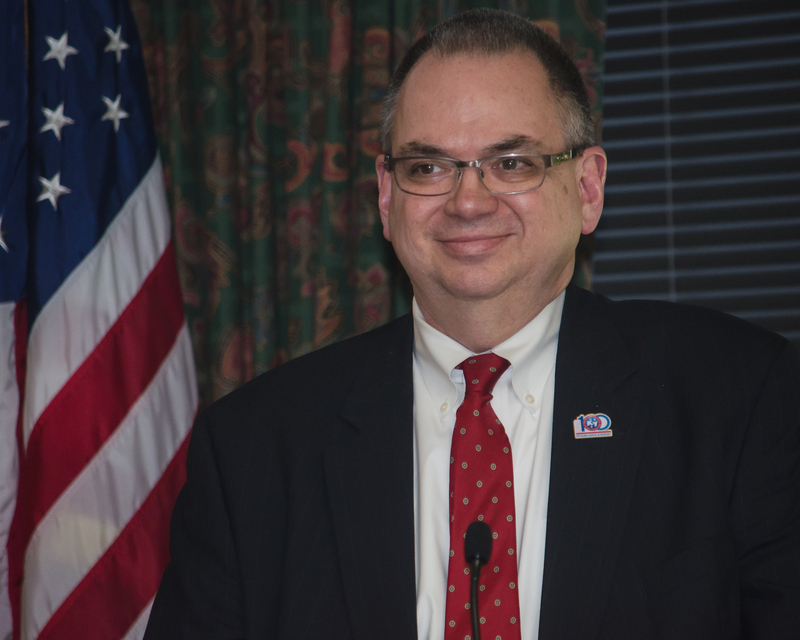 He’s also been a board member of Health Literacy Kentucky and he’s on the board for the Bank of Buffalo in Hodgenville, Ky., where he contributes to the bank’s strategic direction. His parents used to jokingly refer to their son, Robert Zaring, M.D., MMM, MSHI, a Louisville pathologist who loves both business and science, as Alex P. Keaton and Spock. Dr. Zaring is President and Laboratory Medical Director at Louisville Pathology Associates, PSC, where he’s worked for the past 18 years. Not only is he the first physician in his immediate family, he’s also the first person to complete four years of college. He was initially interested in studying business after graduating from Trinity High School in Louisville where he won a business award, but was persuaded by his uncle, Doug Barnes, an optometrist, to study medicine instead. “My dad told him I could remember anything and that I was good in school,” he said. His father, Ronald, married his stepmom, Mary, when Dr. Zaring was four years old. Ronald is a retired electrician who worked at Ford and Mary was a secretary. “They also owned a lawn care service and she ran it,” he said. He majored in biology at Bellarmine University and graduated from the University of Louisville School of Medicine in 1995. Even though he was first in his class his third year of medical school, he said he didn’t enjoy it. He decided to talk to physicians in various fields, “not so much to find out what they did, but to find out how happy they were,” he said. Dr. Zaring completed his surgical pathology fellowship at the University of Iowa. “They were all very academic but it was very relaxed,” he said. Following his fellowship, he went to work for Louisville Pathology Associates, PSC, where he says his coworkers share that same academic but laid back vibe. “All my partners are awesome,” Zaring said. When Carolyn Burns, M.D. retired from her role as the practice’s laboratory medical director for Jewish Hospital, Louisville, Dr. Zaring was asked to take her place. He decided he needed more business training so he earned a master’s degree in medical management at Carnegie Mellon University in 2010. He should know. He recently completed a master of science in health informatics at the University of South Florida Morsani College of Medicine where he learned about electronic health records, project management, legal issues and patient information. Zaring has served on the Kentucky Medical Association’s Board of Trustees since 2009 as the AMA alternate delegate and just finished serving as president of the Greater Louisville Medical Society (GLMS). He’s also a graduate of KMA’s Community Connector Leadership Program (CCLP). During these leadership roles, he said he’s impressed with the talent among his fellow physicians and enjoys their camaraderie. In his spare time Dr. Zaring enjoys CrossFit workouts and traveling the world. His favorite trips were to Italy, Croatia and Turkey. He and his best friend, Tyler Current, have been to Budapest, Vienna, Salzburg, Germany, Prague and Costa Rica. With his friendly, outgoing personality and desire to keep learning, Dr. Zaring hopes to continue exploring the world and the field of pathology. Photo: Dr. Rigby is pictured receiving her Community Connector Leadership Program award from Dale Toney, M.D., chair, KMA Board of Trustees, at the 2017 KMA Annual Meeting. Photo by David Knapp. Tenacity and Sense of Social Responsibility Drives Cynthia Rigby, M.D. Before she began a successful career in medicine, Cynthia Rigby, M.D., had been a substitute teacher, a foster care worker and a tax collector, just to name a few of the interesting assignments in which Rigby served. She had always been interested in science and medicine, but her ambitions were derailed as she began college by lack of resources. Rigby grew up in a small farming community of about 400 residents in Farnham, N.Y. With two brothers behind her, her family couldn’t afford to send her to medical school. Social responsibility was stressed in her hometown, where she served as a teacher’s aide in a school for migrant children, giving her a first-hand view of economic, educational and health disparities. Thanks to a national science scholarship award she received in 1967 from Bausch and Lomb, Rigby was the first in her family to go to college. She earned a bachelor’s degree in psychology with a minor in education and history from the University of Rochester, where she met her husband, Ron. An engineer with GE, Ron participated in a training program in Lynn, Mass., where she taught as a substitute teacher. They moved to Kentucky in 1971 after he completed the program. After settling in, she became a foster care worker with the State of Kentucky, then served as a revenue officer with the Treasury Department. She was only the second woman in Kentucky to serve in this role. In 1978, with her husband’s encouragement, she started taking pre-med classes at the University of Louisville. She continued working full-time at the Treasury Department while taking classes until she quit work to focus on her studies. With a year before she could start medical school, she needed to earn money and went back to work as a temporary clerk in the same office branch where she had served as the acting manager. During her rotation, she had the opportunity to work with M. Steven Piver, M.D., the renowned physician at the Roswell Park Cancer Institute in Buffalo, N.Y., who conducted early research on the connection between genetics and ovarian cancer. Piver wrote Gilda’s Disease with Gene Wilder, a book about Gene’s wife’s battle with ovarian cancer. After completing medical school in 1985, Rigby did her residency in OB-GYN at Bethesda Hospital in Cincinnati and then returned to Louisville in 1990, beginning her career in medicine at Louisville Physicians for Women and Women’s Health Care, now known as All Women OB/GYN, PSC. Challenged by health issues, she stopped practicing as an obstetrician in 2000 to “save her own life,” she says. She was falling asleep at traffic lights and ended up diagnosing herself with thyroid issues. Feeling better, she continued practicing gynecology and returned to school again to earn her second master’s degree in health services management at Webster University to better understand medicine’s business side. She discovered that unless she did a lot of surgery to support herself as a GYN, she was paying more into other people’s retirement funds than she was paying into her own. Rigby decided to leave the group practice and began a new chapter in life. She went out on her own for a while before closing her office. Then she assisted in surgery and helped out at the Veteran’s Administration in the women’s service until it no longer supported malpractice costs. Currently, she does consultation work for the State of Kentucky as a reviewer. Her volunteer activities are numerous, including work with the Greater Louisville Medical Society Foundation (GLMSF) Mission Committee. She’s getting ready to go on her eighth medical mission trip to Nicaragua with GLMSF in conjunction with Hand in Hand Ministries, where she serves on their board. She also serves as a Phi Delta Epsilon student advisor at the University of Louisville medical school and volunteers at the Mercy Medical Clinic in Shelbyville. Rigby was contacted by KMA to participate in the Community Connector Leadership Program (CCLP) because of her active volunteerism. At first she thought, “I don’t need to put anything on my CV,” she said. The only thing she hadn’t done to qualify as a CCLP was the online tutorial about how to work with your community. “The program (CCLP) makes you think outside of medicine and go beyond the office and into the community,” she said. Monalisa Tailor, M.D., had an on again, off again interest in medicine growing up. Dr. Tailor, an internal medicine physician at Norton Community Medical Associates: Barret, had targeted a career in cardiology when she was a high school student in Bowling Green. So she opted out of medicine as she was a student at the University of Kentucky. A self-described politico, she instead focused on political science, with biology mixed into her major studies. When she began to help care for her grandfather, Nat Tailor, she found her heart still pulled her to the medical field. While she was also accepted at the UK Medical School, Dr. Tailor decided another change was in the Cards—she decided to attend the University of Louisville School of Medicine intent on specializing in pediatrics. When she found herself catching many of the ailments from her young patients, she made the move to internal medicine. Dr. Tailor became involved with KMA in 2006, her first year of medical school. She now serves as Kentucky’s delegate to the American Medical Association’s Young Physicians Section. She’s a member of the 2016 class of KMA Community Connectors. As a political science major in college, Dr. Tailor said it just makes sense for physicians to be involved in organized medicine, particularly dealing with legislation affecting medicine at both the state and federal level. It’s been good, she said, to see the patient get on track. She knows it doesn’t happen overnight and sometimes it takes constant encouragement to help patients, whether it’s controlling drug addiction, quitting smoking or losing weight. “Hopefully, something you’ve done or something you have said helps motivate them to make a change,” she said. Dr. Tailor is in the first cohort of KMA’s Kentucky Physicians Leadership Institute, offered in conjunction with Butler University. She serves as treasurer for the Kentucky Physicians Political Action Committee, or KPPAC, and as secretary for the Greater Louisville Medical Society. She also is a member of the 2016 class of the KMA Community Connector Leadership Program. Leadership isn’t new to her. She was chief resident at UofL and was a member of the 2016 class of Ignite Louisville through the Leadership Louisville Center, a leadership program for young professionals. Leadership roles are important for physicians, Dr. Tailor said. Dr. Tailor’s parents, Mohan and Indu Tailor, owned and run a motel in Bowling Green. She started helping out at the front desk when she was a kid in elementary school and sometimes still helps out when she goes home for a visit. Her hobbies include arts and crafts; she’s an avid reader and likes board games. One of her favorite games now is Pandemic, in which players have to diagnose and eradicate a disease. That on again, off again interest in medicine is now permanently on … and extends to what she finds entertaining. Don Swikert, MD, receives his 2015 CCLP award from Brent Wright, MD, KMA Board Chair. Also pictured is Don's wife Nancy Swikert, MD, a 2015 CCLP graduate and 2016-2017 KMA President. Don Swikert, M.D., wanted to be a physician “for as long as I can remember.” But while the various turns his career path has followed weren’t necessarily in his plans, he believes he was ready for them, in part, because of his involvement in organized medicine groups like the Kentucky Medical Association. “You never know what is going to fall in your lap,” said Dr. Swikert, who served as KMA president 2002-03. He’s a member of the 2015 class of KMA Community Connectors. Dr. Swikert and his wife, current KMA President Nancy Swikert, M.D., opened a practice in northern Kentucky in 1980 at a time when small practices—those with one, two or three physicians—were the norm. Managed care was starting about that time and the Swikerts eventually joined a growing trend, merging their practice with other small groups, laying the foundation for what is now the St. Elizabeth Physician Group. Long involved in KMA, Dr. Swikert joined the KMA Board of Trustees in 1989, serving first as AMA Alternate Delegate from 1990 to 1994 and then as AMA Delegate starting in 1995. Through that involvement he gained the skills he needed, particularly communications skills, to serve as the president of what was then Primary Care Associates from 1994 to 2001. “You have to communicate in a way that makes them (physicians) want to (merge) … to pursue a bigger vision,” Dr. Swikert said. To manage the practice group, Dr. Swikert had to give up two days of clinical time. In the early 2000s, an insurance company called Choice Care started and he served as a Northern Kentucky member for the company’s board. He was scheduled to soon exit the board and believed the person who served on that board should manage the practice group. “Information in business is what you make decisions on and determines where you want to go,” he said. So he stepped down as head of the group, returning to clinical practice and faculty member full-time. Not long after that, the Family Medicine Program Director at St. Elizabeth Healthcare stepped down. Many of the residents encouraged him to apply. “I knew nothing about running a program, but those skills (gained in KMA and AMA), I believe, opened that door for me to be able to do that,” he said. So he applied, and was offered the position, which he held for 17 years. Looking back, he said, those soft skills from association involvement helped prepare him to serve. That’s why he believes strongly in physicians getting involved in their associations. Swikert, who chairs the KMA Legislative Quick Action Committee and the KMA Commission on Legislative & Political Advocacy, knows the importance of involvement on a broader scale. That wasn’t always the case. Sitting in Commonwealth Hall, the grand entrance of the Thomas J. Clark Center for Kentucky History in Frankfort, Dr. Swikert admits he would not have been one of the many medical students in attendance at the 2017 KMA Physicians Day at the Capitol. But as he set up practice with his wife, they realized the importance of involvement because of the discussions on scope of practice issues. So he got involved. While he’s been involved with legislative advocacy since 2001, Dr. Swikert said he can’t remember a time that any legislation that didn’t take a few years to pass. He’s happy with the evolving nature of physician involvement, and points to the large turnout to the KMA Physicians Day at the Capitol as evidence of energized engagement on the issues. 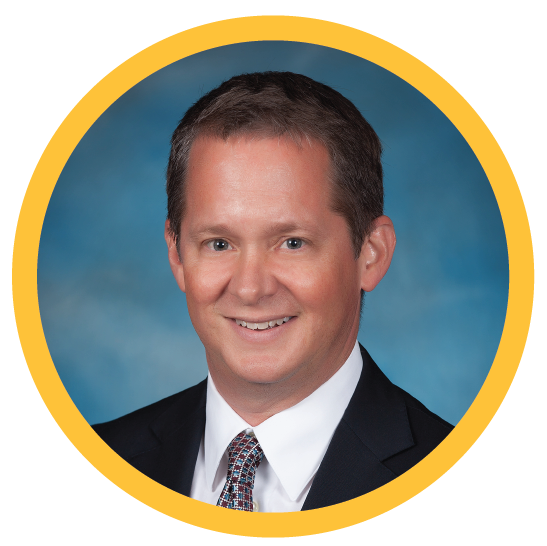 Dr. Swikert was born at St. Elizabeth Hospital in Covington and grew up in Fort Mitchell, where he graduated from Dixie Heights High School. He graduated from the University of Kentucky with a degree in biology in 1973, then from the University of Louisville Medical School in 1977. He completed his residency in family practice at St. Elizabeth in 1980. He had every intention to enter the field of plastic surgery; after all, it was visits to his plastic surgeon in his youth that prompted his interest in medicine. “On his walls were all these pictures and awards and all these different things, and I thought, ‘that’s what I want to do,’” Dr. Swikert said. In medical school, he took a four week elective with a plastic surgeon at UofL. The surly nature of that professor, especially compared to his own affable nature, turned him off. “That whole four weeks, he never spoke to me,” Dr. Swikert said. The next rotation came in family medicine, of which William P. VonderHaar, M.D., a former KMA president, was program director. He and Dr. Swikert’s orthodontist at the time pointed him in the direction of family medicine. It’s a career turn he’s glad he took. “I still enjoy the practice of medicine,” Dr. Swikert said. He’s still on the faculty at the St. Elizabeth Family Practice Residency Program and handles the vast majority of hospital rounds. Outside medicine, Dr. Swikert, a self-professed country boy, enjoys being outside on his 23 acres in Rabbit Hash, which reminds him of the area where he grew up. In fact, ask about his hobbies and he will tell you he’d rather spend the time mowing eight of that 23 acres than playing golf. In his many years of service to KMA and working with residents at St. Elizabeth Healthcare, Dr. Swikert can look back and see what he did through positive results in the association and the medical practices of many protégé. Mary Helen Davis, MD, seemed to always be on the path for a career as a physician. “I was one of those people who kind of decided when I was 6 years old that I wanted to be a doctor,” she said. In sixth grade, she volunteered at the American Red Cross washing out test tubes or anything else someone her age could do. She worked as a candy striper at old St. Joseph’s Hospital in Louisville. “My entire focus was on going to medical school from a very early age,” Dr. Davis said. Her family moved from Louisville to Northern Kentucky when Dr. Davis was in high school when her father was transferred to the Cincinnati/Northern Kentucky Airport. She graduated from Dixie Heights High School and attended Thomas More College, majoring in chemistry. There, she met her husband, Al Martin, MD, a pathologist in Louisville. They married soon after graduation; Dr. Davis attended the University of Louisville Medical School and Dr. Martin attended the University of Kentucky Medical School for a year before transferring to Louisville. Dr. Davis graduated medical school in 1982, finished residency at UofL in 1986 and completed a fellowship at Harvard in 1987. Dr. Davis is board certified in psychiatry, psychosomatic medicine, as well as Hospice and Palliative Care. Although she is currently employed through the physician group, Integrative Psychiatry, her passion is working with complex medical patients especially those dealing with a cancer diagnosis. She currently serves as program consultant to Baptist Health, working with their oncology program in developing supportive care services. Dr. Davis has seen a lot of changes in medicine over the years and expects more to come. “What the younger physicians have to realize is that change is accelerating,” she said, as she ticks off a list of the quickly changing aspects of medicine—the delivery models of practice, the introduction of technology, the economics of medicine, and a more balanced gender representation in the practice of medicine, just to name a few. Those changes have created some stress issues, causing physician burnout, she said. Some change has been positive, Dr. Davis said. “With all of the many advances in medicine, it’s very exciting to be able to watch the evolution of one’s practice in terms of the repertoire of options you have in treating patients,” she said. For instance, when she graduated medical school, only a few psychotropic drugs were available to manage depression. The stigma for psychiatric illnesses has decreased and there is more of a push toward the integration of behavioral health into mainstream medicine. “If you neglect behavioral health issues, you can’t control chronic disease, cost issues,” Dr. Davis said. She uses her experience through these changes as she works with young physicians. She mentions the accomplishments of residents, including Daniel Jackson, a second-year resident who recently acquired a nine-month internship on Capitol Hill to work with Congressman Jim McDermott of Washington state on health care issues, and others who have been recipients of resident leadership awards. She strives to do that through her work with residents. This year, she received the Irma Bland Certificate of Excellence in Teaching Residents Award presented by the American Psychiatric Association. She is actively involved in KMA and Greater Louisville Medical Society, where she is past chair of the Policy and Advocacy Committee. 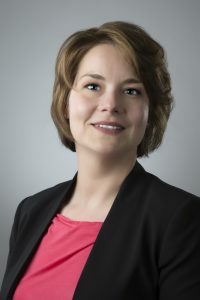 She is a member of the 2015 class of the KMA Community Connector Leadership Program, which she said falls in line with her core professional values. That includes, among other things, patient advocacy, leadership on public policy and consideration of the health care delivery systems, as well as other areas that medical school doesn’t teach. The KMA Community Connector program, she said, is an avenue of participation in KMA leadership programs. 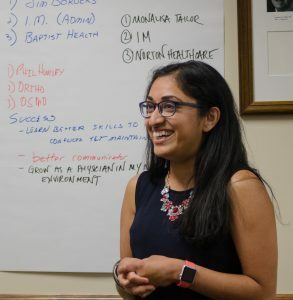 “That has become a really important part of medical practice, in addition to the clinical practice, is having an impact on policy, obtaining leadership skills and physicians filling leadership roles within their community,” she said. Dr. Davis said that’s an important lesson for young physicians. “Medicine, with all its challenges, is still a very exciting and rewarding place to have a career,” she said. “If I had to do it all over again, I would definitely do it all over again. Beyond her medical career, Dr. Davis is an avid outdoorsperson. She spent her recent birthday weekend in The Parklands hiking, biking and kayaking. She also plays a lot of tennis. “I subscribe to the philosophy, work hard and play hard,” she said. Over three decades in Louisville’s emergency rooms, Robert Couch, M.D., has seen the scourge of drug abuse run the gamut from heroin to powder cocaine to PCP to meth and back to heroin again. The death rate through those changing drugs of choice remained fairly consistent. Until now. Couch has been on the front lines in the battle against heroin addiction in Kentucky and that has brought a lot of attention to his recent experiences. Over the course of 32 hours in February, for instance, Louisville emergency services responded to 52 overdose calls. Couch was interviewed by national and local news outlets to discuss his experiences treating many of those patients. His contributions in addressing the region’s heroin epidemic garnered recognition by Business First as a “Lifetime Hero” when the publication recognized its 2017 Health Care Heroes. And his expertise dealing with the crisis is in demand for lawmakers across the country striving to address the issue. He spoke last month in Denver, and was scheduled to speak again this month in Indianapolis, to a group of legislators about the problem. Dr. Couch has been an important part in addressing the life and death issues of the problem since his early days in medicine. In fact, he touted his interest—and experience—in emergency care when he was applying to medical school. He knew that he’d like to be a part of the nascent specialty of emergency medicine, so in an effort to stand out among other medical school applicants, he and a buddy at the University of Alabama decided to become paramedics. “We thought that would be a pretty neat way of distinguishing ourselves because no one else had done it,” Dr. Couch said. He explained that in the early 1970s, the federal government was providing funds for states to develop EMS services, and the West Alabama EMS—which served Tuscaloosa—worked to develop a rather robust emergency medical service. Besides the invaluable experience Dr. Couch gained working as a paramedic, he also was able to get college credit for the classes. He enjoyed the work so much that he continued to moonlight through college and in the breaks between the first and second years of medical school at the University of Alabama-Birmingham. Those early years dealing with emergency medical situations lay the groundwork for Dr. Couch’s continuing career as an emergency physician in Louisville. Louisville was a good place for Dr. Couch to land—the University of Louisville has the second oldest emergency medicine department, according to a history of the program on the UofL website. Plus, Dr. Couch said, when he was ready to match for residency in 1983, UofL had what he wanted in a residency. As he was nearing the close of his residency program, St. Mary & Elizabeth Hospital asked the Department of Emergency Medicine at UofL to run the emergency department for the hospital. As chief resident, Dr. Couch was tasked with putting together a group of residents to address that need. So with a few months left in his residency, Dr. Couch founded Southern Emergency Medical Specialists, PSC, and began staffing St. Mary & Elizabeth Hospital with his team. In fact, the independent emergency department group of physicians, nurse practitioners and physician assistants now serves Norton Audubon, Norton Downtown and Norton Brownsboro hospitals. Dr. Couch is the Emergency Department Medical Director at Norton Audubon Hospital. At age 60, Dr. Couch still enjoys the variety of cases that come through the emergency room doors as he did 32 years ago. A lot has changed over that time, but some things are still the same. Dr. Couch is a native of Tuscumbia, Ala., the birthplace of Helen Keller. He had planned to attend Auburn University with many of his high school friends, but a teacher arranged for him—a merit scholar—to get an alumni scholarship at the University of Alabama. Dr. Couch and his wife, Wilma, have two daughters—Mary Claire and Julia. 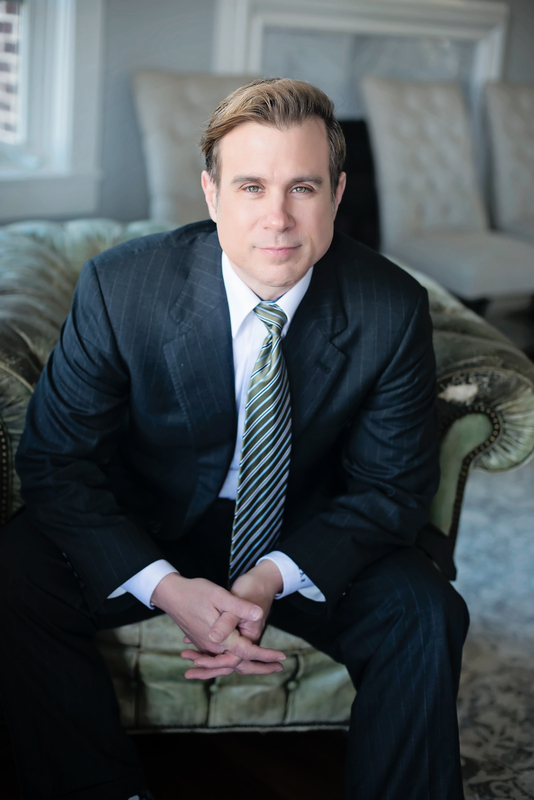 Dr. Couch is in the third year of a three-year leadership commitment at the Greater Louisville Medical Society—he served as president-elect in 2015, president in 2016 and is now chair of GLMS. He’s also on the KMA Board of Trustees and serves as chair of the Kentucky Physicians Political Action Committee. Outside organized medicine, Dr. Couch often reaches for the clouds—his longtime hobby, though not as active now, is hot air ballooning. His passion for helping people often finds him overseas with the Teach to Transform organization, founded by a partner, Thomas McKechnie, M.D. “For a number of years, I would do mission trips where it was a clinical model,” Dr. Couch said. But he was always left to wonder about the people who couldn’t get clinical care during that trip. Teach to Transform is a medical mission, but its goal is to train leaders in a community in medical skills. These trips teach basic medical care, wound care and neonatal resuscitation skills, for instance. The second year focuses on more advanced medical skills and the third year focuses on helping those community leaders train others. The organization, he said, is starting to partner with other organizations around the country to provide needed training worldwide. “I think it has great promise,” Dr. Couch said. 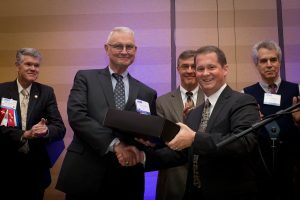 Rice Leach, MD, left, is shown receiving his Community Connector Leadership Program award from KMA Board Chair Brent Wright, MD. 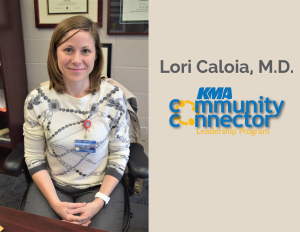 The KMA Community Connector program is designed to recognize leaders in their community and in medicine. Rice Leach, MD, embodied both to a degree that, with his death April 1, left a void across the Commonwealth, especially in the public health arena. Dr. Leach was in the first class of Community Connectors in 2014. In addition to serving as Lexington’s commissioner of health in his final years, Dr. Leach had previously served the Commonwealth as public health commissioner from 1992-2004 and the nation as chief of staff to the U.S. Surgeon General. In March, the Lexington-Fayette County Board of Health presented Dr. Leach, via Skype, the 2016 Public Health Hero award and announced plans to rename the award in his honor. 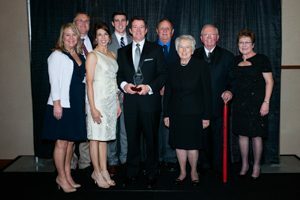 Lexington Mayor Jim Gray thanked Dr. Leach for his service to the city and its residents in a statement issued at the time of the award. 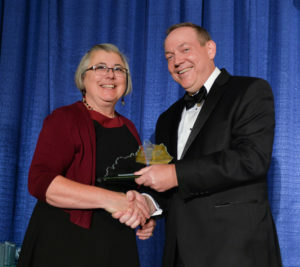 “He truly is a Public Health Hero because he has made Lexington citizens healthier and given them better access to the health care services they need,” Gray said. Dr. Leach was an active KMA member and had attended the KMA Physicians’ Day at the Capitol event in mid-February, as well as the KMA Public Health Commission meeting that day. Leaders of KMA reacted with sorrow to Dr. Leach’s death. It was that innovation and leadership that, according to a former chair of Lexington’s board of health, saved that city’s health department. Scott White, a Lexington attorney, told the Lexington Herald-Leader that Dr. Leach’s leadership spurred recent department initiatives, including integrating safe food trucks into Lexington’s street dining and a needle exchange program designed to combat the spread of blood-borne disease. He had written a piece, “Kentucky Physicians in Public Health,” for KMA’s 150th anniversary publication, “A History of Medicine in Kentucky 1851-2001,” detailing the history of public health in the Commonwealth. Don Neel, MD, formerly of Owensboro, echoed Cooper’s sentiments. “Rice was a special soul and one of a kind. … He had such a way with words and his wisdom ran deep. He had so many favorite sayings like ‘the canoe doesn't just leak on my side,’” Neel said. “Even if you disagreed with him, you respected his view and perspective which usually was well founded. “We are all better to have known him and the patients and citizens of Kentucky will miss him,” Neel said. When Danesh Mazloomdoost, MD, sees the challenges of his high-stress field of pain management medicine as insurmountable, he picks up a camera. Peering through the lens of his camera gives Dr. Danesh, who minored in photography while at Case Western Reserve University, a more centered focus. Both his parents – mother Camellia Shirazi, MD, and father M. Mazloomdoost, MD – are both physicians practicing in Lexington. They started a multidisciplinary pain clinic when Dr. Danesh was in his pre-teens and spent many of his summers at the clinic. So it would seem natural that he would have followed in their footsteps. That wasn’t always the case. “I tried my hardest not to!” he admits. In fact, he majored in medical economics and business management at Case Western, where he had a scholarship and pre-admission to medical school. But he was more interested in health care policy. “I thought I was going to go into figuring out how we could fix the gaps in health care … the problems of the uninsured and the disparities within health care,” he said. He was interested, specifically, in operations management – how businesses work together. He saw a correlation to medicine – how the different organ systems keep us alive. So he moved more toward a career in medicine, attending medical school at Johns Hopkins and moving to Cincinnati for internal medicine internship before returning to Johns Hopkins for a residency in anesthesia. But he found he was more interested in the more complex issues of pain, specifically related to cancer, and went to MD Anderson Cancer Center in Texas for training in pain management. He mentions the adage, “pain is inevitable, but suffering is optional.” His goal is to address some of the suffering that comes with pain and help people grow from it. “There are so many different interpretations of why people have pain,” he said. That recently evolved into what Dr. Danesh calls “this quandary of the opioid epidemic” that manifested from misunderstandings about chronic opiate exposure and the mismanagement of pain. “Pain is the way your body communicates with you … it tells you when things aren’t functioning properly,” he said. It’s like the “check engine” light on an automobile – you can either figure out what is causing the light to come on or you can put a black sticker over it, which is what we do with opiates, he said. Dr. Danesh believes that for a long time, physicians were placating pain in some way, but were not well-versed in the best way to sustainably do so. It was more along the lines of a traditional disease-based model of medicine instead of the healthy and preventive model of medicine. Dr. Danesh likes being involved in organized medicine through the Kentucky Medical Association and the Lexington Medical Society because it brings physicians out of the niches they’ve carved for themselves. “The communication I have with clinicians when they deal with patients in pain helps me understand the forest from the trees picture on how the opiate problem is developing and what we can do about it,” he said. Dr. Danesh is passionate about the treatment of pain and sees Kentucky as a sort of ground zero in dealing with the problem of opioid abuse. It’s a daunting prospect, but Dr. Danesh said KMA’s Community Connector Leadership Program has helped him gain focus. In fact, he and his fiancé, Andrea Omidy PhD, a psychologist who focuses on disordered eating, recently purchased the former Eagle Creek Library in Lexington with the hopes of building a multi-disciplinary wellness center that seeks to redefine health care. From the earliest he can remember, John Johnstone, MD, always wanted to be a doctor. In fact, when he was a student at Berea Foundation High School, Johnstone worked in the Berea College Hospital’s housekeeping department, taking out trash “before they had plastic bags.” He chuckles when he says that, illustrating the level at which he started and the path he has traveled to become a leader in health care in Madison County. He later worked in medical records and then in the laboratory at the hospital while attending Berea College. His father had served as chair of the college’s agriculture department. At Berea College, he met his wife Sandy. Hanging around the hospital in Berea paid off. Johnstone was admitted to medical school at the University of Louisville, graduating in 1974. He spent three more years at UofL for a fellowship in general internal medicine. Johnstone married Sandy during medical school. The couple has two children – daughter Elise, an Episcopal priest in Lexington, and son Andrew, who works with the Environmental Protection Agency in Durham, N.C., doing research on molecular cellular biology – and two grandchildren. Degree and experience in hand, Johnstone returned to Berea Hospital – this time fulfilling his dream to be a physician. He spent 11 years practicing general internal medicine before deciding what he really wanted was to focus on the heart. He returned to Louisville for a fellowship in cardiology. Johnstone saw a need in his home county, which didn’t have a cardiologist to help combat the most common cause of death – heart disease. “I just looked at it and said, ‘that’s where you can do something and make a difference,’” he said. He’s making a difference in health care in other ways. 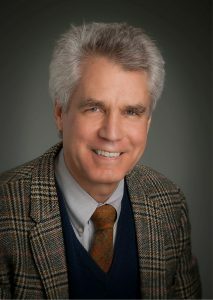 Johnstone, who now practices cardiology in Richmond, has served on the Madison County Board of Health from 1978, shortly after he returned to the county to practice medicine, continuously with the exception of the three years he was in Louisville for his cardiology fellowship. Johnstone now chairs the Madison County Board of Health but was a member of the health board when it passed the smoke-free ordinance, the first county board of health to do so in 2007. He believes that’s the most significant action the board has done in his time on the board. “I really think we’ve saved more lives than any doctor will ever do in their life by passing that smoke-free regulation,” Johnstone said. That’s one reason he’s a key player in the Kentucky Medical Association’s current public health campaign, “Commit to Quit.” As president of the Madison County Medical Society, he pushed for the group’s participation in the campaign. Johnstone is also chair of KMA’s Public Health Commission. He points out the KMA was founded in 1851 as a way to get doctors together to help fight the cholera epidemic. He believes interest in public health is still the primary reason for KMA’s existence. He believes a statewide smoke-free law, if it ever passes, would be a turning point for Kentucky. “Smoking is the leading preventable cause of death and disease in this country and it’s the thing I have in my bullseye right now,” said Johnstone. His goals, however, include several arenas of public health. When he was President of the Kentucky Medical Association in 2013-14, Fred Williams, MD, wanted to do something that would help physicians connect with KMA and with their communities. “The concept is to get docs and people in the community together,” Dr. Williams, an endocrinologist in Louisville, said. As Williams talked with KMA staff, the idea grew with the recognition that physicians in the commonwealth also could benefit from leadership training. From those early discussions, the KMA Community Connector Leadership Program was born. Dr. Williams was one of nine physicians completing the program in its first year. The Community Connector program aims to develop physician leaders and connect them to their community. Those community relationships are important, Dr. Williams said, as are the relationships physicians build with their patients. As an endocrinologist, Dr. Williams has built long-term relationships with his patients, some of whom he has served for 32 years. 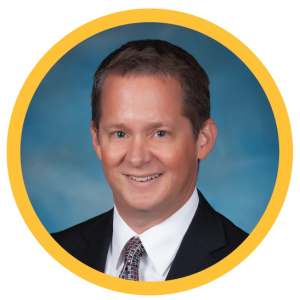 Dr. Williams has been president of the Greater Louisville Medical Society and KMA, and has served on national boards of various medical societies, but he takes the most pride in the people he cares for. Dr. Williams saw early in his life the qualities of a good physician. Around the time he graduated from St. X High School, he was diagnosed with type 1 diabetes. His endocrinologist in Louisville “interacted with me on a much more personal level.” That relationship, he said, made him feel more comfortable with the physician treating him. While that physician set the example for traits of a good physician, Dr. Williams was not immediately on the path to becoming an endocrinologist. After graduating from the Vanderbilt University, where he met his wife Sally, Dr. Williams returned to Louisville for medical school. After graduating, he moved to Charlottesville, Va., for residency and fellowship for five years where he fully intended to become a pediatrician or a cardiologist. But he didn’t settle on a specialty until after he worked with several endocrinologists at the University of Virginia. “I think I’m doing this because I was meant to do this,” said Dr. Williams. But that doesn’t mean he doesn’t face frustrations, especially when working with patients who need to lose weight, or trying to inspire some patients to quit smoking. “You have to fight that because if patients sense you’re frustrated, you’re basically pushing them away and you’re not going to be able to help them,” he said. And the state needs help. “Kentucky is always in the top 10 in things you don’t want to be top 10 in,” he said. It has a strong combination of factors, Dr. Williams said, “that have led to this monumental cascade of health issues.” While the needle is starting to move for improvement, public education is the first step in improving public health. He believes physicians play a key role in moving that needle, and the KMA Community Connector program can contribute to their efforts. When he was a student at Vanderbilt University in the late 1960s, John Patterson, MD, assumed he would become either a doctor or a lawyer. In fact, he took entrance exams to both medical school and law school while at Vandy. His acceptance into the University of Tennessee Medical School drove his decision to enter medicine, but his motivation to become a physician grew because the example set by Albert Schweitzer, the noted theologian, pianist, philosopher and physician. Dr. Patterson graduated Vandy in 1970 and had considered staying in college an extra year to study comparative religions, but entered the University of Tennessee Medical School, graduating in 1973. After completing a general internship in Memphis, Dr. Patterson moved to Lexington, where he worked as an emergency physician for two years before completing a family practice residency at the University of Kentucky. It was then, in 1980, that he followed Dr. Schweitzer’s model and looked for his own community in need. That’s how he ended up serving the medical needs of Estill County for 30 years. During that service, Dr. Patterson became active in advocacy for public health and was named by KMA as an official liaison between the association and the Health and Agriculture Forum, a group of health advocates and agriculture interests who came to the table with the common goal of protecting youth against tobacco. When KMA established the Community Connector Leadership Program in 2014, Dr. Patterson signed up because, he said, the program was stressing ideals by which he had long lived. In addition, he said, “I thought it was a way to bond with colleagues who had been doing similar things,” he said. The involvement of the late Rice Leach, MD, a public health champion, solidified his interest in participating in the first class of Community Connectors. The goal of the program is to connect physician leaders to their communities. Dr. Patterson does that in spades. While participating in the program, Dr. Patterson suggested to Chris Hickey, executive vice president/CEO of the Lexington Medical Society, the creation of a physician health and well-being initiative, which evolved into the LMS Physician Wellness Program. It was an issue of huge importance to Dr. Patterson. Medical school and residency, once an all-male domain, was highly competitive in which students and residents were expected to “man up” and deal with the pressures. The LMS Physician Wellness Program is 100 percent confidential, a criterion Dr. Patterson calls “incredibly important.” He believes the program is vital in the ever-changing, high stress field of medicine. For the past 14 years, he’s taught a course called “The Healer’s Art: Remembering the Heart in Medicine.” The course, which is taught in more than 100 medical schools, emphasizes the concept of wholeness for physicians. In addition, he teaches mindfulness-based stress reduction through the UK Wellness Program, and offers a similar class to the community through his office, Mind Body Studio. He also teaches an Argentine Tango class every Friday night. The concepts of the dance, he said, are similar in important ways to the practice of medicine. It points in the direction of human capacity of compassion, which is why many people get into medicine. “If we keep alive the flame of compassion that leads us into medicine, we’re more likely to serve our patients well, to serve our staff well and to serve our community well,” he said. That attitude ties into another effort in which Dr. Patterson is involved. He is working with a group to create Compassionate Lexington, a formal designation created by the Charter for Compassion. Compassionate cities – Louisville has that designation – involve government, medicine, education, social services, businesses and criminal justice, among other groups, in their efforts. “There’s no better place to demonstrate that compassion is alive and well than in the practice of medicine,” Dr. Patterson said. A native of Viper, Ky., in Perry County, Latonia Sweet, M.D., knows firsthand the many health barriers many people in rural parts of the state, and country, face. 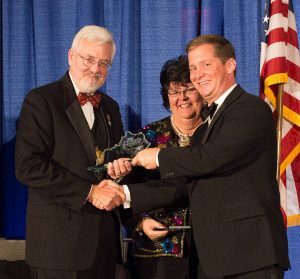 “My life expectancy as a woman from Perry County was lower than most everybody in the U.S. in 2012,” said Dr. Sweet, a member of the 2016 class of the KMA Community Connector Leadership Program who was recognized earlier this year by Medical News with the Medistar Physician of the Year award. She’d like to change the circumstances that contributes to that, part of which, she believes, comes down to behavioral health issues. Dr. Sweet has served as medical director at Bluegrass.org, a nonprofit community mental health center serving central Kentucky, since 2013, where she has worked since before she completed her residency at the University of Kentucky in 2005. Dr. Sweet graduated from Morehead State University, where she was a research assistant on neuroreceptor research, in 1996. She had initially targeted a career in research and planned to complete a doctorate in neuroscience, but chose to attend the University of Kentucky Medical School, from which she graduated in 2001. But a residency rotation in Powell County swayed her toward becoming an outpatient psychiatrist. She comes from a large family, very impoverished, “poor working class folks like many of the clients I now serve,” she said. She saw the problems many of those people faced, including substance abuse disorders. Although Dr. Sweet has been the medical director at Bluegrass, she kept her patients in Powell County. She’ll soon be leaving Bluegrass for a position working to integrate the behavioral health component in primary care practices. It’s important, she said, because behavioral health practices can impact physical health. For instance, she said, there is a behavioral health component to helping people manage diabetes or quit smoking. Volunteer work is important to Dr. Sweet. “I was taught always that the best thing you could ever be is to helpful to someone,” she said. Those values were instilled in her by her parents, Rick and Connie Rice. Her parents didn’t graduate from high school but “really instilled the need for education. I was told that you will get an education so you don’t have to struggle.” Her parents had obtained their GEDs and furthered their education later in life. Her father was a coal miner who later gained certification to become a mine inspector. Her mother went back to school and became a nurse. Seeing the struggles of many of her current patients, Dr. Sweet said her work helps her live her values. “That one of the best ways I think I can be of help to my fellow Kentuckians. Helping people have their best lives … making sure substance use treatment is part of their general health care,” she said. That requires education of others with whom these patients may come into contact. It’s different, she said, for those who have addictions. “People need to understand the biological changes that take place with this disease,” Dr. Sweet said of these patients. Her volunteer work entails talking with public officials, judges, boards and other physicians about the neurobiology of addiction. Evelyn Jones, M.D., believes physicians, by virtue of their positions, are automatically presumed to be leaders in their communities. Dr. Jones, a 2016 graduate of the KMA Community Connector Leadership Program, should know. Not only has she seen that role firsthand as a dermatologist in Paducah, but she also grew up the daughter of a physician/leader, Wally Montgomery, M.D., a retired general surgeon, who served as 1985-86 KMA president and in other capacities throughout his career. The program, which stresses community as well as medical leadership in its requirements, prompts participants to find outlets in their communities where they can make a difference, Dr. Jones said. She believes that can make a difference in a physician’s outlook on the profession. That feeling was instilled in Dr. Jones at an early age. She would often go to the hospital to watch her father perform surgeries. She knew then that she wanted to be a physician, and that she wanted some aspect of surgery connected to the specialty she chose. A high school biology teacher allowed her to do some very advanced science projects involving transplantation of a pancreas in guinea pigs. While Dr. Montgomery was advising his daughter on the surgeries, her mother, Gerry Montgomery, allowed the family’s home to serve as post-op recovery area for the guinea pigs. 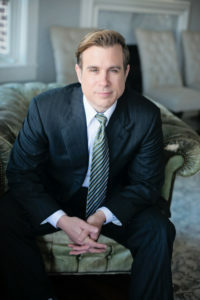 After graduating from Paducah Tilghman High School, Dr. Jones attended Georgetown College then the University of Louisville School of Medicine. Dermatology initially wasn’t on her radar as far as a specialty. She just knew she wanted to do something where surgery was involved. But she also knew she wanted to be a very involved mother, in part because her mother set such a high bar—“My mother was such a wonderful and involved mother,” she said. When she was exposed to dermatology, Dr. Jones knew that was her calling. It includes a strong surgical component with the different skin cancers she removes. But it also has the added bonus of allowing Dr. Jones to treat a wide range of ages—from young children and teenagers to adults and the elderly. “I love people and so I love getting to have that exposure,” Dr. Jones said. But it also gave her the ability to limit her schedule so she could be involved in her children’s lives. She and her husband, Shawn Jones, M.D., have three children—Rebecca, who is working on her PhD at Emory University in Atlanta, Shawn Curtis Jr., a first year medical student at the University of Louisville, and Caleb, a junior at UofL. Even though the Joneses are empty-nesters, Dr. Evelyn Jones makes sure the home isn’t completely empty. She mentors teenagers and leads Bible studies at her church, Southwest Church of Christ, for adult women and teens. She often has the middle school girls from her church at her home for lessons in etiquette and cooking. They’ll learn to make a casserole and take it to an elderly person or someone who just had a baby in their community. She carries that philosophy into her office as well. Each year, her office has a theme for the year. At the Christmas party, she reveals the upcoming theme and the team discusses the past year. The 2016 theme was “Legacy” and Dr. Jones’ office had a special intergenerational event for the community. While it included discussions about nutrition and a focus on health and beautiful skin, the key message was stressing value and purpose for each individual. Often, that leads to giving back. “When we do something for someone else, when we pour into other people, at every age, we are really the ones who gain fulfillment from it,” she said.